In recent times, artists/songwriters, who once made their living recording and writing songs, have been severely affected by the slump in royalty revenue coming from labels, publishers, and rights organizations. The decline is not only attributed to piracy and market trends, but to a shift in consumer demand to digital delivery formats. Artists/ songwriters claim the new music economy is not compensating them fairly or evenly, and this paper draws together recent research on the subject. A growing number of artists and songwriters have come forward to voice their dissatisfaction with the little money they receive from digital streaming. Some artists who are fortunate to control their own recordings have gone as far as to pull out their catalogs from streaming services like Spotify, YouTube, and Apple Music1 while others strike lucrative deals to make their catalogs available to streaming sites for the first time.2 Songwriters who are not also recording artists with some level of control over their recordings aren’t as lucky. The combination of traditional record label deals signed early in their careers, the section 115 compulsory licenses, and the ASCAP and BMI antitrust laws have made it impossible for them to take any action against these services. But digital streaming also includes YouTube, which is regarded as the largest music streaming site in the world and is largely governed by private dealings and not the rules that audio-only internet radio services like Pandora are subject to. YouTube in particular is notorious for its measly and erratic payouts3 and under the protection of the DMCA Safe Harbors (section 512 of the Copyright Act) it is probably the largest provider of music copyright infringing material on the web.4 The thousands of sites where songs are streamed, the different types of digital streaming services that exist, and the different laws/ regulations/ ratesetting models that apply in each case have combined to create a chaotic environment where the parties that stand to lose are the service providers/platforms/organizations that license music as part of their business and the talented artists, producers, and songwriters that create it. 1. The right to reproduce. 2. The right to distribute. Together with the right to reproduce, this is the “mechanical” right. 3. The right to perform publicly. – Terrestrial (broadcast) radio stations are exempt from paying for any sound recording public performance rights. This 1972 law was passed when artists and labels relied on AM/ FM radio broadcasters to promote their music, which, broadcasters argued, turned into increased profits for record labels and artists from album sales and touring. In today’s satellite radio and digital streaming market, such promotional value is arguably a fraction of what it used to be. – Services that allow users to stream music on-demand, meaning that users can specify exactly what song or album they would like to listen to. Example: Spotify and Tidal. – Services that include video. Example: YouTube and Vevo. 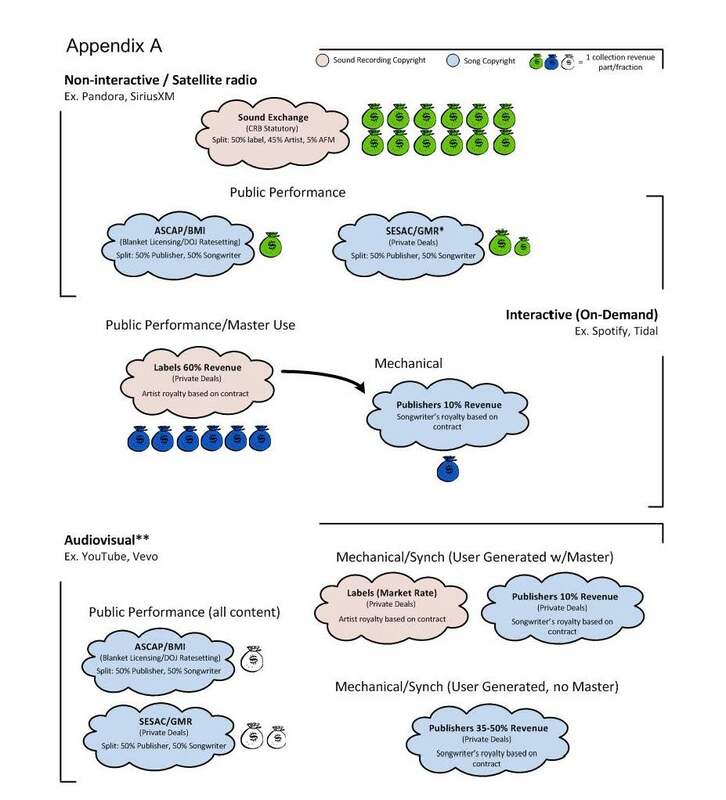 Appendix A shows the streaming models, what source of income is collected by performance rights organizations (PROs), record labels, and publishers. Where known, the revenue split is shown. Sound Exchange (SoX) is an independent nonprofit organization that collects statutory license-only, non-interactive sound recording public performance royalties on behalf of label and artist members. A digital radio performance of a popular song recording may generate revenue for both SoX as well as ASCAP/BMI who collect on behalf of publisher and songwriter members. However, as Appendix A shows, SoX’s collections for the same stream as compared to those of ASCAP/BMI are much higher, reportedly by a ratio of 12:1 (some say as high as 14:1).13 Bette Midler’s highly publicized $114.11 royalty payment from Pandora for 4 million plus plays can in fact be shown to yield a high ratio of 23:1. It is worth noting that SoX does not collect royalties for digital services that include an audiovisual component (e.g. YouTube, Vevo). YouTube, the world’s biggest music streaming service, enters into direct, private deals with copyright owners for mechanical/synchronization rights. As far as the value of each stream, the average is approximately 6/10 to 8/10 of a cent.21 That means that a $1.29 song download is equivalent to about 160 to 215 streams. To calculate the royalty rate per stream, Spotify divides up the monthly streams of an artist’s song by the total number of streams in that month. That tiny share is multiplied by the total monthly revenues minus 30%. However, as mentioned before, some streams are worth less than others based on geographical location and whether the stream is from a free service. Spotify’s website states that its premium service “delivers more than two times the amount of revenue to the industry (per year) as the average US music consumer currently does,”22 citing an NPD Group statistic which states that out of an internet population of 190 million, only 45% consume music and those who do spend $55/year compared to the $120/year they would spend for a Spotify full subscription. While the numbers appear realistic, the premise in that argument is not because $55/year is taking into account a market where piracy and free services like the Pirate Bay and YouTube and even Spotify’s own free tier dominate. Because record labels typically require licensees to sign non-disclosure agreements, the exact terms of their private dealings with Spotify were unknown. That is until late 2014 when a highly publicized hacking scandal leaked a copy of Sony Music’s licensing agreement with Spotify. The document confirmed that record labels receive approximately 60 to 70% of subscriptions and ad revenue yet only 14 to 16% of what they receive or 10% of the overall Spotify revenue is paid to publishers. It is well known too that the share of artist and publishing royalties has not varied by much despite the elimination of certain costs such as packaging/manufacturing and distribution. Whereas the two are not necessarily connected, many in the industry argue that the record labels’ keeping of a larger share of the revenue from today’s digital stream in comparison to what they kept from yesterday’s CD appears unjustified. If we consider the overall income generated by digital service providers, a number of intriguing questions come to mind: How are the financial benefits of advances and advertising space to record labels shared with artists and songwriters? What about capital gains derived from the equity they own, is that benefit shared with artists/songwriters? What about those artists that have old recording contracts without any payout provisions for digital streaming? Sony’s deal with Spotify revealed the presence of big royalty advances in the order of $9 to $17.5 million per year in quarterly installments which aren’t treated as royalty revenue until Spotify actually reports on period stream data. Advances are of course recoupable, but include a “minimum guaranteed revenue clause,”28 which essentially means that if either the advance or the agreed minimum guaranteed exceed the royalties/revenue sharing earned during the licensing period, then the label is protected thanks to “breakage” and gets to keep the difference. Other clauses in the same deal “allow Spotify to keep 15% of its ad revenues sold by third parties ‘off the top’ without accounting them as revenue” and also require Spotify to give Sony “advertising inventory at a discounted rate in the amount of $2.5 to $3.5 million per year, which Sony is then able to resell for a profit.”31 It is unclear how these obscure arrangements provide any benefit to artists and publishers/songwriters. – PROs can’t refuse to grant a license to any user that applies even if pricing terms are not agreed to by licensees. – Licensing terms should be the same and cannot discriminate against licensees in similar standing/positions. – PROs must offer alternatives to the blanket licensees if requested. – PROs may only represent nonexclusive rights. The decrees basically shifted the balance of power away from the PROs and to songwriter/publisher members and licensees. With the shift in consumer demand, away from terrestrial radio/TV and into the digital/online space, the existence of the consent decrees gave digital service providers such as Pandora and iHeart Radio an enormous advantage heading into rate negotiations. Adding to the imbalance is the disparity in the law created by Congress’ decision to not require broadcast TV/radio stations to obtain licenses for public performance rights of sound recordings. This terrestrial radio exemption also limits sound recording copyright owners’ ability to collect royalties on foreign radio/TV broadcasts as most foreign collection agencies would not release the funds due to lack of reciprocity.37 It’s possible that the revenue lost due to this exemption influenced how market forces interacted to even the playing field in favor of record labels and artists when it came time to set rates for digital radio service providers like Pandora and SiriusXM. It is worth noting that the DOJ consent decrees only apply to ASCAP and BMI repertoire, but not to Global Music Rights (GMR), a newcomer PRO that started operations in 2013, and SESAC repertoire, both of whom represent significant catalogs of works. This disparity of application gives a competitive advantage to newer PROs that are not subject to the same anti-trust regulations. GMR was founded around the time the issue of “fractional licensing” came about— when publishers attempted a partial withdrawal of ‘new media’ or digital rights from ASCAP/BMI. The goal of the publishers was to circumvent the norms set by the DOJ consent decrees so they could negotiate directly with digital service providers at higher rates. 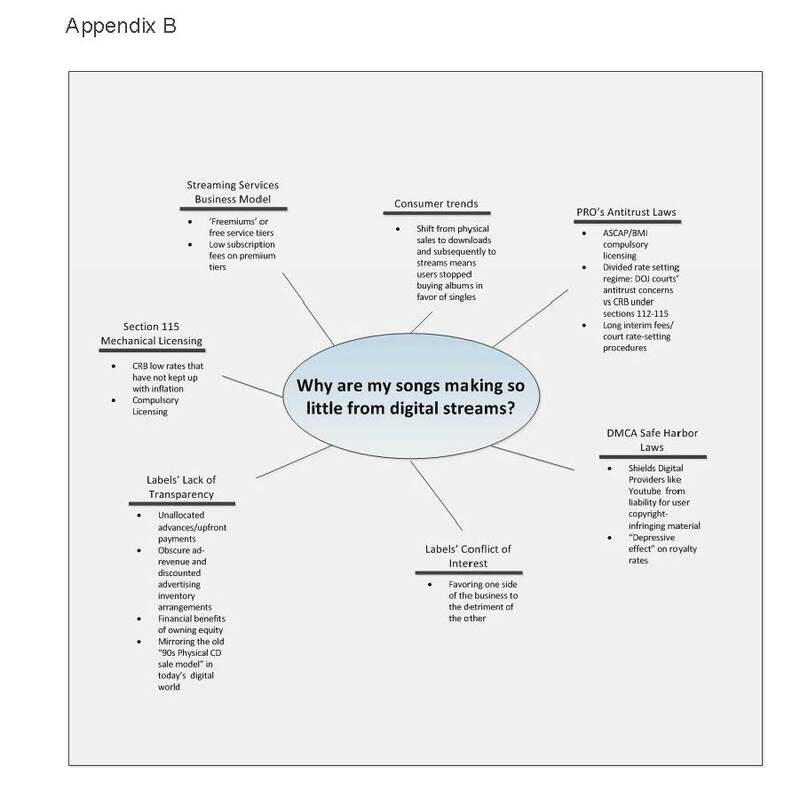 Appendix B summarizes the issues contributing to the decline in artist and songwriting royalty income. The issues appear to fall into one of three categories: regulatory, business/organizational, and market-oriented. Some of the issues/categories are interconnected, and therefore influence or impact one another. For example: regulations such as the DMCA Safe Harbors that are well-intentioned but not free of collateral damage to intellectual property rights. While online piracy and shifting consumer patterns are a contributing factor, it is fair to hold that the lack of an integral solution that addresses the diverse licensing needs of music users in the marketplace in addition to the lack of fair, flexible, and comprehensive government regulations bear the greatest impact on the measly royalty checks artists, but particularly songwriters, receive today. Service providers like Spotify readily defend their models, basically stating that “a little money is better than free.” For artists, per- haps the stage at which their careers are plays a part. Developing artists and established artists with solid catalogues that tour extensively need the exposure and can probably take the loss. However, artists that do not tour as much or are growing their catalogues cannot afford it. Several in this latter group have expressed that they prefer to continue to weather the storm than settle for pocket change. With the pocket change also comes the impact of a continued degradation in the perceived value of music. The fact that the revenue generated by the sale of such a niche product as vinyl records has been able to generate more revenue than free/ad-supported digital streaming ($226 million vs. $162.7 million in the first half of 2015) is perhaps the best indicator of the music industry’s “poor ability to monetize its non-physical products.”43 Both the RIAA and Spotify appear to agree that while paid services continue to compete with “free,” market forces will not let digital streaming subscription service rates go any higher.